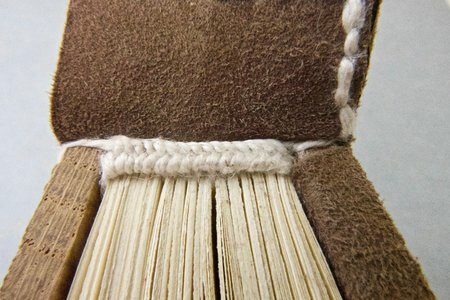 While studying at West Dean, a key and sobering lesson I have learned is that most of the objects you will work on as a book conservator will be brown. Sometimes reddish-brown, sometimes greenish-brown, but still basically brown. Accordingly, there was cause for celebration when The Royal Jubilee 1935 came across my bench. Figure 1. Jubilations! Some colour at last! 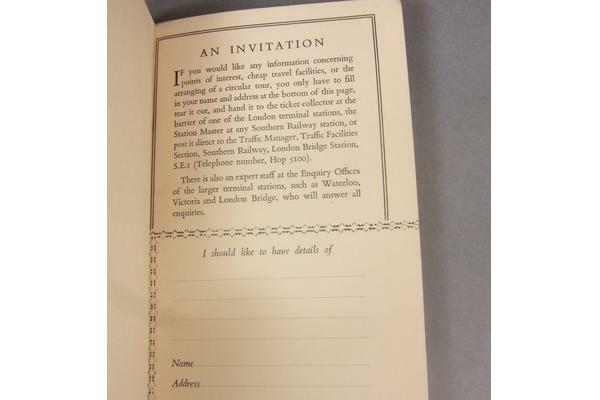 The Royal Jubilee 1935 or Thrice Welcome. This jolly little red, white and green pamphlet was produced by the Southern Railway to celebrate (the title gives it away) the 1935 Royal Jubilee. However, the collection of three essays inside, entitled Thrice Welcome and illustrated with some lovely wood-engravings by Eric Ravilious, have little to say on that subject. Instead, they evoke a beguiling image of southern England bathed perpetually (if implausibly) in summer sunshine. In "The Beauty of Southern England", S. P. B. Mais takes the reader on a whistle-stop tour from Dover to Dorchester, pointing out illustrious literary associations and particularly picturesque places along the way. Charles Graves discusses the "Social and Sporting Season", enumerating celebrated venues from Goodwood to Wimbledon where one can enjoy everything from horse-racing to tennis, accompanied by lashings of strawberries and cream and responsible amounts of champagne. The emphatically educated Prof D. I. Fraser Harris B.Sc. (Lond. ), M.D., D.Sc., F.R.S.E, lauds the south as "The Birthplace of English History", and highlights our own nearby Chichester Cathedral as boasting the only spire in England visible from the sea. 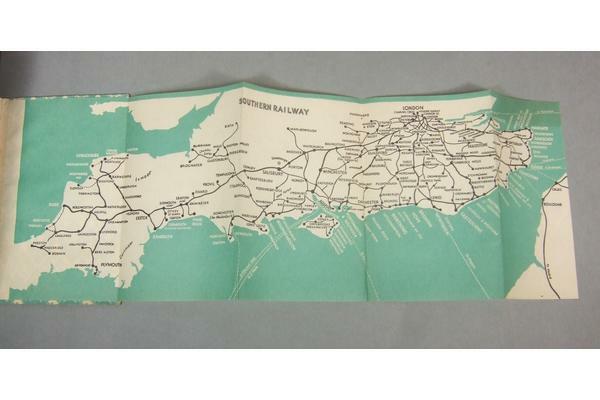 If you were starting to suspect that all this is a patriotic advertising plug to lure tourists onto south-bound trains, your suspicions would be confirmed by the travel information inquiry form and fold-out map of the Southern Railway at the back. Figure 2. To find out more…. Figure 3. The fold-out railway map inside the back cover. But don't be dazzled by the decorative exterior or purple prose: all this embellishment masks a troublesome conservation conundrum. 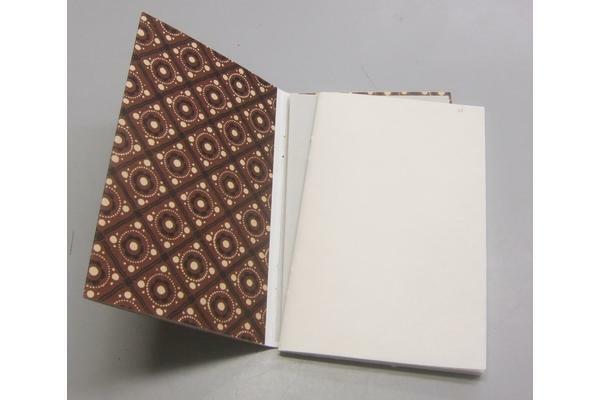 This tiny volume is constructed of a single section textblock, stapled through the spinefold to a paperboard wrapper. The fancy green and white covering paper is wrapped around the outside, and has extended foredge flaps secured inside each board by a thin line of adhesive near the gutter. Stapling a few pages together is a pretty quick and economical way of making a codex, but in the long run, paper and iron do not play nicely. 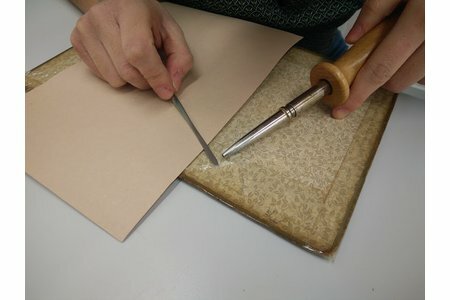 As the staples corroded, they released ferrous ions that migrated into the surrounding paper, and catalysed deterioration of the cellulose (the main organic material that makes up the paper fibre). As a result, the paper adjacent to the staples is discoloured, brittle and crumbling, and the staples themselves have disintegrated. The fall out of this is that the textblock has fallen out of its cover. Figure 5. Paper and iron do not play nicely. Figure 6. ‘Til corrosion do us part… cover and textblock no longer one. 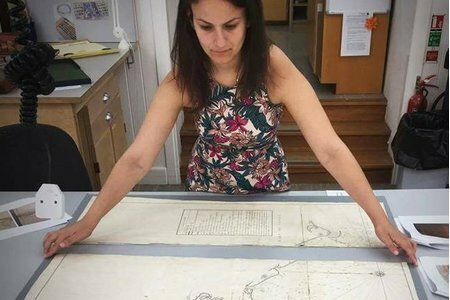 The Royal Jubilee's owner hoped to see these disparate parts reunited into a functioning book once again: a straightforward treatment aim, but, as it turns out, not so straightforward to achieve. 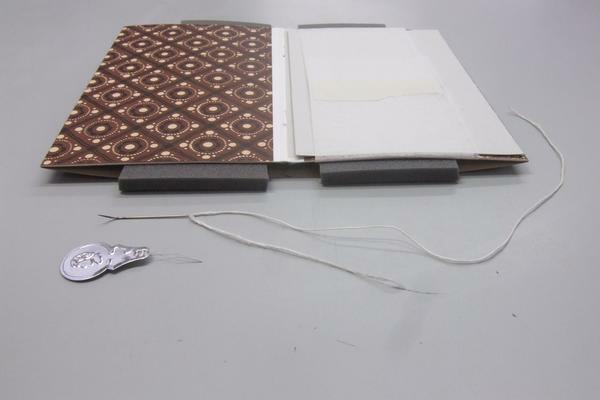 As I made a condition assessment, it became apparent that only the innermost bifolia were badly damaged enough to require repair, and that because the book is so small and light, a couple of stiches through the two pairs of original staple holes would be sufficient to hold textblock and cover together. But there was one major snag. 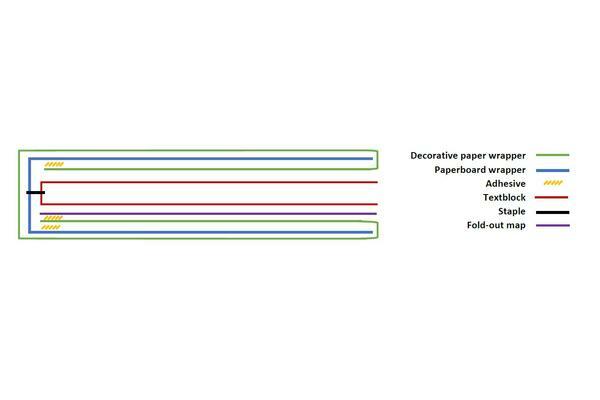 Look again at Figure 4. 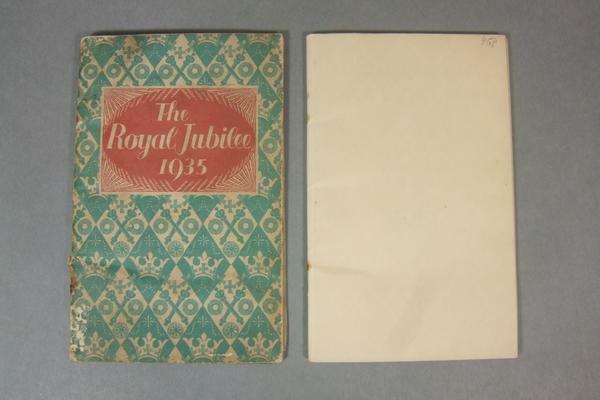 When the Royal Jubilee was first put together, the textblock and cover were stapled before the decorative paper was glued over top. 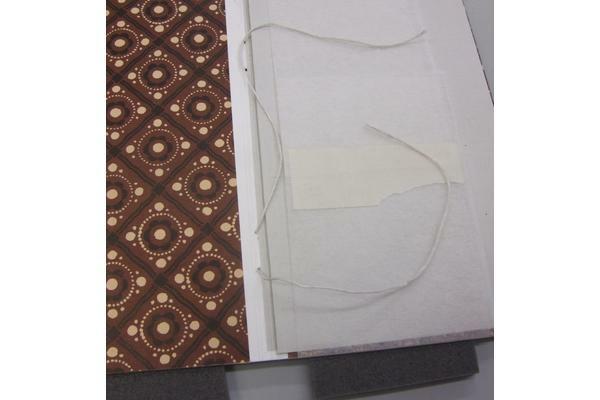 Now I had to figure out how to sew them back together, but with the decorative paper already in place and preventing me from accessing the spine in order to get the needle in and out. 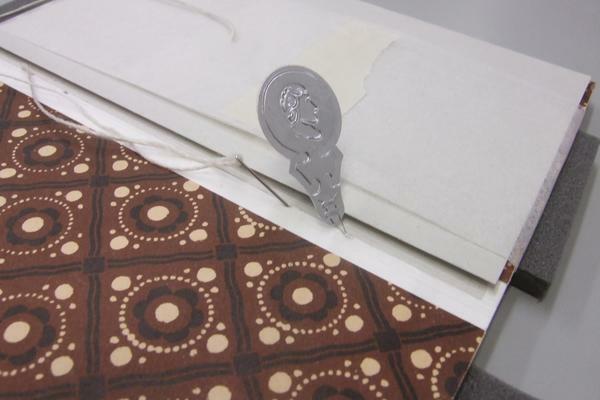 Apart from a little damage near the tail, the decorative paper was still basically intact, and perfectly well-stuck. It would be difficult to justify cutting or lifting it off for the sake of making two stitches. There is no 'textbook' answer for a lot of conservation questions. Instead, a viable solution has to be arrived at through trial and error. But when it comes to working on historic objects, a little less error is preferable. Accordingly, I made a model of the Royal Jubilee on which to trial (and error) different sewing methods. 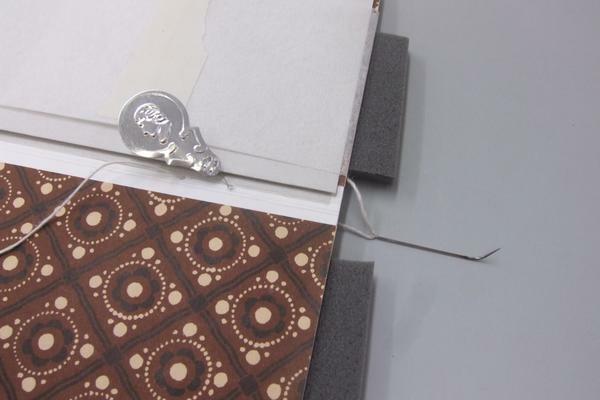 Given the option of a number of brightly coloured papers with which to cover my model, I chose brown. Figure 7. 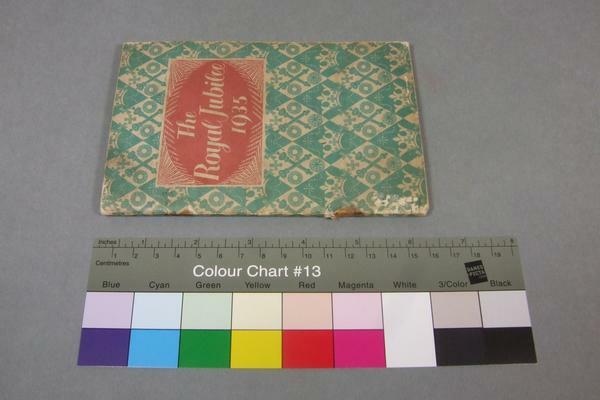 You can take the conservator away from the brown book, but you can’t take the brown book out of the conservator. I now had a structural copy of the Royal Jubilee that I could manipulate with impunity. 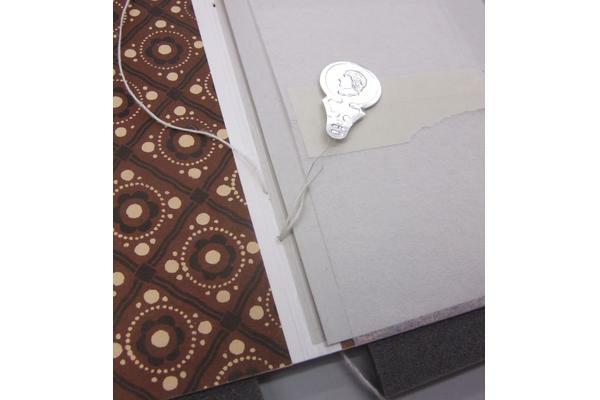 This enabled me to see that if I could somehow support the cover opened flat, this would allow the covering paper to lift away from the spine, and let a needle pass in and out without piercing the decorative paper. My tutor suggested that using a curved needle would make sewing in the confined space even easier. So I paid a visit to the Metalwork Conservation department, where MA student Kate Jennings kindly heated and bashed out a range of needle shapes for me to try out, and I, watching enviously as she played with naked flames and hammers, wondered if I'd chosen the wrong conservation specialism. Figure 8. 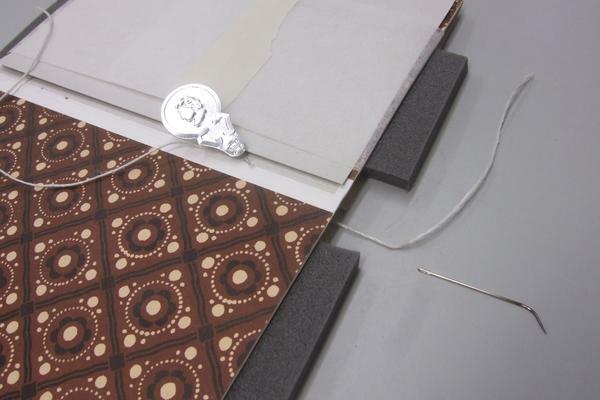 Opening the model cover flat, allowing the decorative paper to be lifted away from the spine. Figure 9. 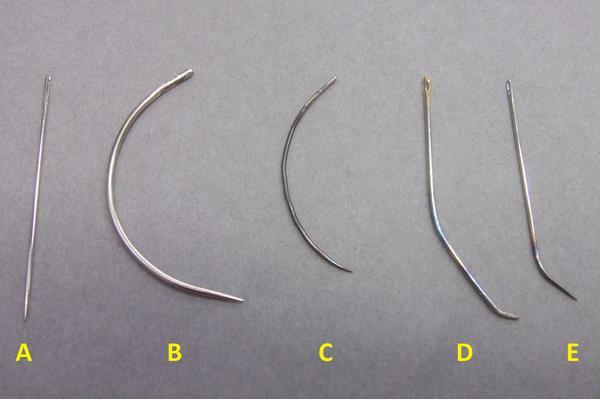 A range of needle shapes to trial: A and B shaped as purchased; C-E altered from straight needles. Figure 10. 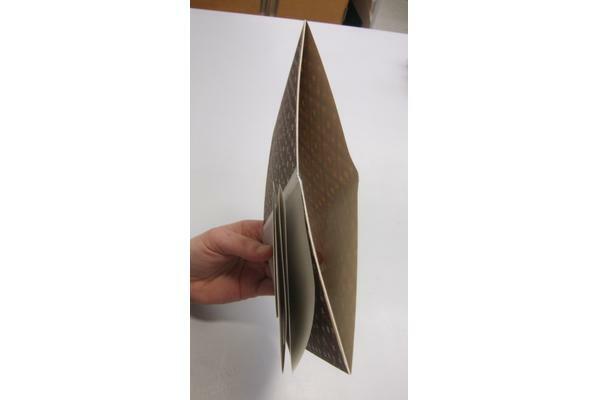 Book cover opened flat and decorative paper lifted away from the spine by strips of Plastazote® (polyethylene foam). Needle shape E proved to be the most suitable. After a bit of trial and error, a needle-threader also proved to be a valuable tool. Figure 11. Needle and thread inserted into one of the holes left by the staple, and the needle threader into the other. Figure 13. …and needle removed from the thread. Figure 14. The thread being pulled back through the spine with the aid of the needle-threader. Figure 15. Both ends of thread back inside the cover, and ready to be threaded onto straight needles and sewn through the textblock. After all that experimentation, conservation on the Royal Jubilee itself can now begin. 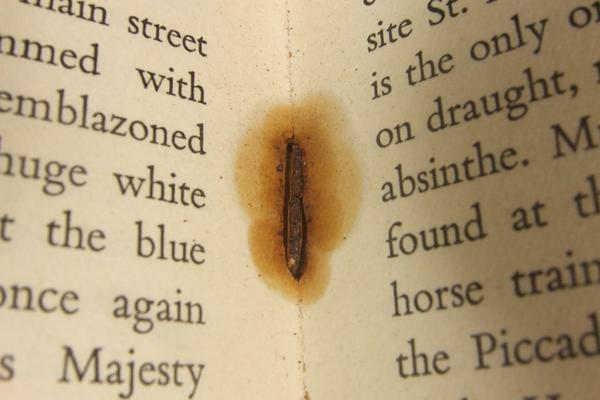 Stay tuned for more Trials and Jubilations in the world of (mostly brown but not always) book conservation.